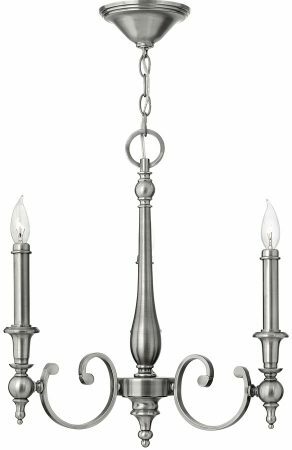 The Hinkley Yorktown 3 light candelabra chandelier in antique nickel finish is a smaller sized chandelier suspended from ceiling mount and chain, with detailed slender body and three heavy flat section graceful double curved arms. The tall slender candle style lights feature lower ball and finial detail. The elegant Yorktown collection offers updated traditional styling with cast detailing for an authentic touch. Yorktown’s tall candle sleeves, finials and ball transitions combine to make this classic design perfect for any decor. The fittings come with both Antique Nickel and off-white candle sleeves, giving you the option to customise your look. The understated traditional influence provides a soft yet stylish look for almost any room. A simple yet thoroughly stylish designer chandelier that will look fantastic in both traditional and contemporary settings. A quality tall candelabra style chandelier full of traditional influences. You can picture this incredibly stylish candle-stick chandelier in any traditionally themed home. It is a lavish example of a Georgian inspired candelabra chandelier. Part of the Yorktown lighting suite that can be viewed below and includes nine and five-light chandeliers, a double and single wall light. Designed in the USA by Hinkley Lighting, founded in 1922 in Cleveland, Ohio. Their long heritage combines with a pursuit of innovative design to create modern and contemporary lighting such as the Yorktown 3 light candelabra chandelier in antique nickel finish featured here.